"Entertainment and Emotions, all are within you. titled ' Kodawatte Furusato' ( my sweet hometown ). aHA's working atelier, CPM studio in Komatsu city. His works of commercial films are more than 4,000 clips. -I do not send any message to people on the film. aHA driving his car on the forest road. -As you hurry up so much, a bear will come to you. -Hasegawa thinks the the origin of all life belongs to water. More pure water its origin is, more power it contains. aHA walking up the forest hill covered with snow. we found a fish farm of 'Iwana' and 'Yamame'. Experience the heart and soul of Japan through the culture of Kaga. a cluster of traditional Japanese houses. Within each dwelling lies an introduction to Japanese traditional handicrafts and Kaga culture. Precious and valuable items are hand made using the most refined skills anywhere in Japan. Become part of the tradition and try these handicrafts for yourself. that are admired throughout the world. udon and soba noodles; perfect for a full meal or a refreshing cup of tea. abundant natural ingredients from the sea and the mountains of Kaga and Noto. The restaurant can accommodate 700 guests. This little cottage is full of fairy tales. You can see how the music boxes are made. Here you can see how the famous “Isuke Manju” steamed buns of Yunokuni no mori are made. Be sure to take some delicious sweets home with you. This is the place to come for a complete range of gifts - chosen from traditional handicrafts, Japanese confectionary and famous Japanese sake. Treat yourself to a visit to this exhibition of artwork and photography. Here you can experience the beauty and mystery of the Japanese Tea Ceremony. The building itself, a 300 year old farm house, also has to be seen to be believed! This traditional landlord's house was relocated and now features an exhibition of historical Kutani ceramicware. Here you are able to try out a potters wheel, or you can simply paint your own design onto one of the items of ceramicware. You can make traditional washi Japanese paper by using natural resources such as flowering grasses and gold leaf. Customize ashtrays, small containers, plates and glasses yourself by carving your own drawing or decorative design onto one of these glass artefacts. A breathtaking line-up of items covered with gold leaf. Try the gold leaf experience yourself! This small dwelling has been created with children in mind. Choose the perfect gift from the items on show. Toshiharu Maeda, lord of Daishoji established thea kiln at Kutani village in Kaga during the early years of the Edo era. Over one hundred steps have to be carried out to complete this handmade product. It takes approximately one year for one item to be produced. Japanese paper is made from raw materials including kouzo (a type of Japanese longgrass) and mitsumata (paper bush). Ishikawa produces 99% of Japan's gold leaf. It is worked until it is 1/10,000th of a millimeter thick. The Kaga printed silk is on a par with Japan's most famous yuzen from Kyoto. The design detail is characterized by natural beauty, such as floral patterns, etc. The Yamanaka lacquering process harnesses the beauty of natural materials. 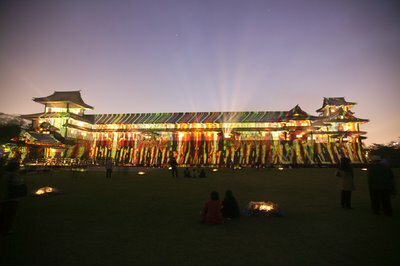 on 12th of October, 2003.
an illusion show of lighting and sound will be taken place. That is "Digital-Kakejiku" art, which we haven't heard before. -Last week, an artist visited the town, Shin-Minato. a countryside of northern part of Japan, Ishikawa Pref. commercial films and title covers, clips..
-D-K is not just an entertainment show. It is to create a space. I like to maximize the effect of these things. where he looks over the Uchikawa River. such a feeling we sense. We become a part of the picture. -We lose the feeling of time, the feeling of space. -When we stand at the infinite space, we realize the infinity of ourselves. 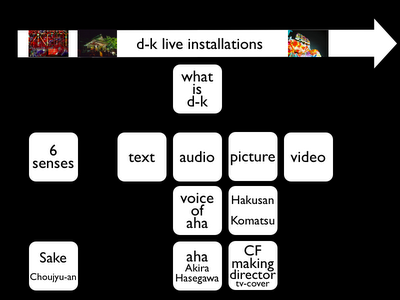 -It is very important thing that D-K is 'Live'. It is a matter of 'being LIVE' for oneself and for each personality. At Kagura-bashi bridge, Uchikawa river, Shin-Minato city. D-K (Digital Kakejiku), which in English can be translated as " a moving Digital-Hanging Scroll", arises in one's mind, specifically relative to what one views. It is the combination of sensory perception and subconscious awareness. The changing scenery of the sunset, the "space" between haiku lines, the "space" between sounds, and the "space" between times - none are tangible, but all are part of experiencing "the moment". When experiencing D-K, the things that you see and feel all come from you. If they didn't exist in you, you would not be able to perceive them in the first place. At a glance, D-K seems to consist of the visual elements seen on paintings. However, this is a completely new art form that uses a different communication style from other art forms which utilize the story telling approach. D-K is a sensitizing instrument that is generated by discontinuous data, and that makes us aware of the time, image, and the idea of a "living present". This live picture is not continuous and has no meaning in itself. Its purpose is to regain the rhythm of life for 21stCentury humanity. D-K emerges from your relationship with what you see. "now", you understand the present. subconscious without nostalgia for the past. In other words, there is only "now". All times are simultaneous. colors, between sounds, between times. this distance between East and West. "being alive here and now". Song by Nana Mouskouri, "Quand tu chantes"
Although very different in execution and expression, two recent media art installations in Japan (Akira Hasegawa's "Digital Kakejiku" and Rafael Lozano-Hemmer's "Amodal Suspension" shared a number of characteristics: both were nighttime, outdoor public spectacles, both used digital data as the raw material and artificial light as the expressive medium, and both partially relinquished artistic control to computer randomization. In each case, invisible aspects of the digital realm were made visible, rendered in light at scales and speeds available to human perception. Immanent global networks were localized, instantaneous electronic transitions were decelerated; space was shrunk as time was stretched. Ephemeral events rather than physical objects, their magnitude was more temporal than spatial. Their existence relied on duration, or more precisely, on delay: a slowing of the speed of light. The "refresh rate" of the human brain is somewhere around 1/16th of a second. Above this threshold, sequences of individual events can no longer be consciously distinguished. A clicking sound faster than 16 Hertz becomes a low bass note; an animated cartoon slowed to fewer than 16 frames per second resolves into a series of individual images. The illusory movement of cinema is the result of interpolation between still pictures by the viewer's brain. Media artist Akira Hasegawa jokes that Disney should return half our money, as we are doing half the work. nights in April 2003, Hasegawa projected a series of unrelated abstract pictures (all previously created by him with a computer) onto the exterior surfaces of Kanazawa Castle, complemented by music from composer Ryoji Ikeda piped through thirty speakers distributed across the castle grounds - the intent was to totally immerse the audience. Although the images were changed at one-minute intervals, there were no abrupt transitions. They were smoothly blended into one another by a computer constantly calculating the intervening states and updating the projection. 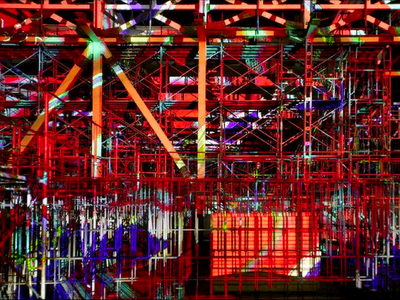 The source images were lost in the flux, merging into a single seamless animation. There was no goal, no evolution, no climax. The beginning and end moments were arbitrary. The gradual movement was barely noticeable. At a glance, it seemed perfectly still, but look away for a minute, and it would be totally transformed. 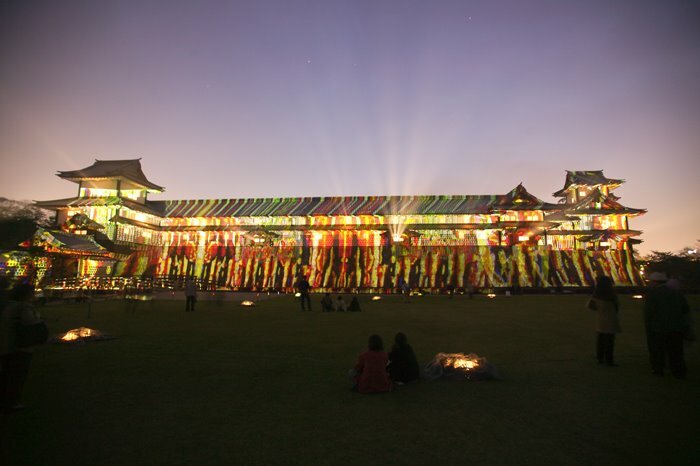 The Kanazawa Castle installation was the first major D-K event, repeated in October at the construction site of Kanazawa's 21st Century Museum of Contemporary Art (designed by Kazuyo Sejima and Ryue Nishizawa). Several other D-K installations have been realized or are in planning, but Hasegawa has been developing the technique itself for a decade. His early experiments used computer monitors, and later shifted to video projectors. 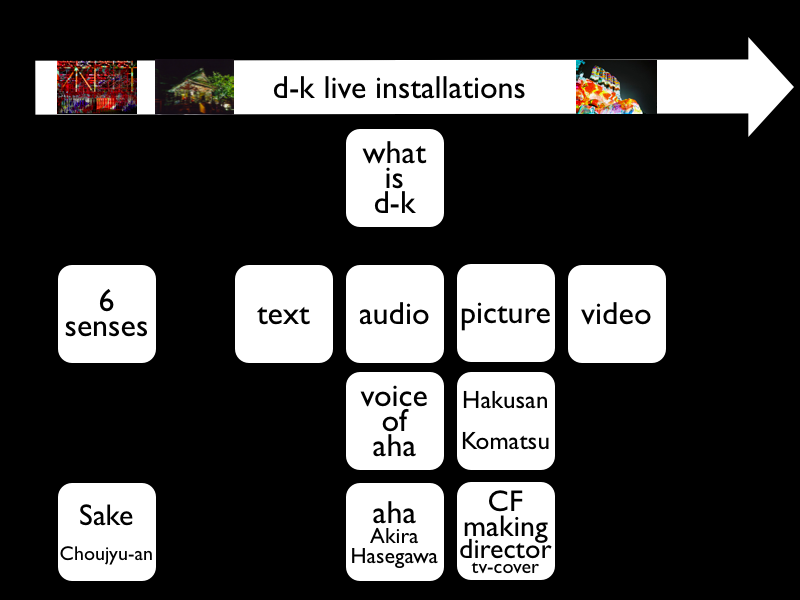 Hasegawa sees D-K as an architectural material, able to actively engage and transform any context, applicable at scales ranging from urban event to computer screensaver. It is practically impossible to freeze-frame exactly the same image twice, and the possibilities of infinite variation have already attracted wide attention: D-K images have been commissioned to convert identical, mass-produced items into unique artifacts, from Mitsubishi Bank credit cards to Issey Miyake fabrics to the billboards at the Nagano Winter Olympics. There is a composition by Frank Zappa entitled 'The Girl in theMagnesium Dress' which he describes as being made of 'digital dust'. (2) It was created on the Synclavier (a combined synthesizer / sampler / sequencer) by taking the digital file of an existing composition and stripping away the numbers representing pitch and duration (ie melody and rhythm), leaving only peripheral data indicating the specific dynamics for each note. This became the rhythm file for the new piece; by assigning pitches to the 'dust', the composer shifted inaudible, abstract data into the realm of audibility. sequences of light pulses at a rate of four letters per second (two per second in the case of Japanese characters). Variations in brightness were determined by the statistical frequency of the given letter in its original language, and the spaces between words became moments of darkness. The messages were not forwarded; instead, their addressees were notified by e-mail that messages were 'waiting for them in the sky of Yamaguchi'. 'Amodal Suspension' was in operation for three weeks in November 2003, to mark the opening of the Yamaguchi Center for Arts and Media (designed by Arata Isozaki in collaboration with the performance art troupe Dumb Type). Reminiscent of the artist's earlier 'Vectorial Elevation' (Mexico City, 1999), the installation hardware was an array of twenty computer-controlled searchlights distributed around an empty field adjacent to the YCAM. The encoded messages were passed amongst the searchlights at random: two beams would intersect, and the pattern would be picked up by the second beam as the first was extinguished. Up to ten messages were in circulation at any given moment, a 'literal flash mob', as Brian Massumi described it. 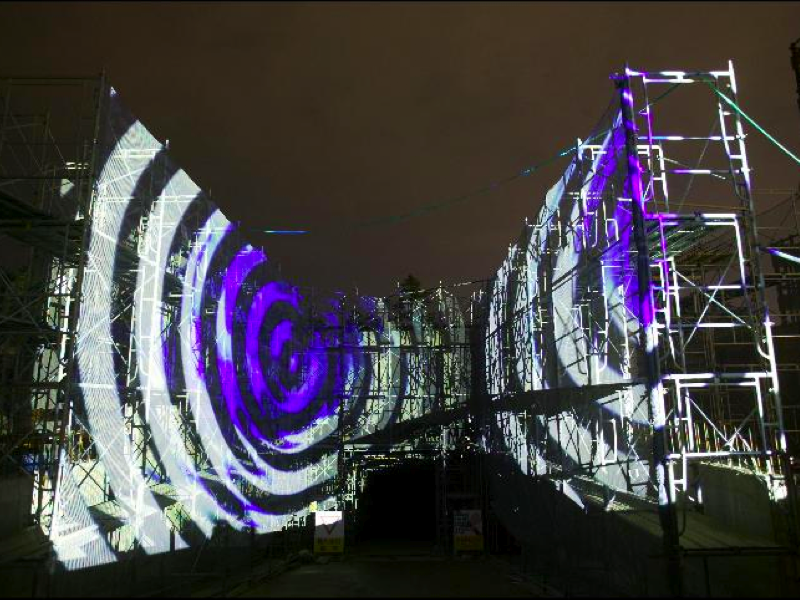 (3) With each exchange, the lights were angled higher and the beams faded in intensity, until the message was accessed from the website by its addressee, or possibly by another observer. The original text was then briefly displayed on an electronic billboard fixed to the exterior of the YCAM, using computer software to translate between English and Japanese. Anyone anywhere with a PC or mobile phone was able to contribute, and dedicated access pods were installed at the YCAM and at sympathetic institutions from San Paolo to New Delhi, including V2 in Rotterdam, ZKM in Karlsru"he, Eyebeam in New York, the Sendai Mediatheque, the Dessau Bauhaus and the MIT Media Lab. 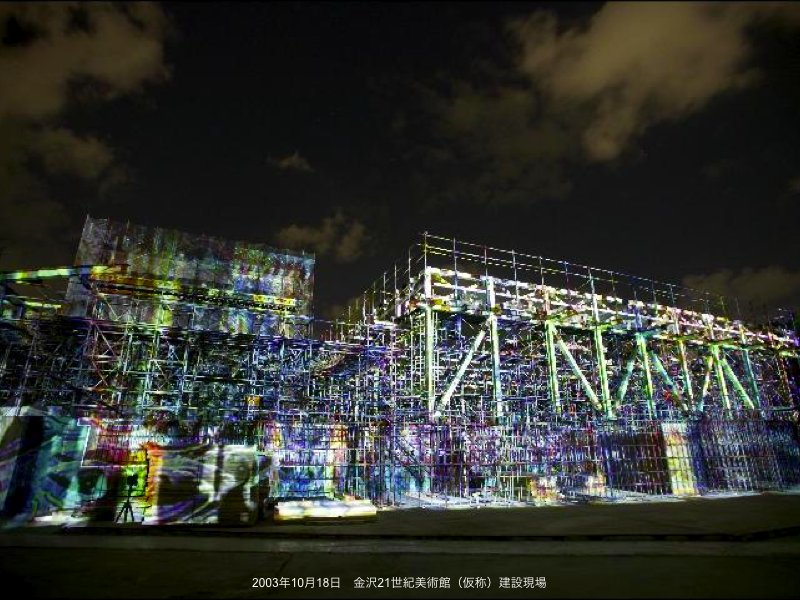 A realtime view of the sky over Yamaguchi City was projected on the ceiling of each venue. The visual impact of this robotic choreography was simultaneous fluid grace and nervous energy, a web of random strobing that appeared to be on the brink of emergent order. The installation was like a holding pen for delayed communication, rendered temporarily illegible; it was not information that was suspended in the sky, but more like its aura: the shadow of the network. 'Like other artists who grew up with Postmodernism, I used to believe that we were finally being liberated from authorship [...] now I argue that there are crucial decisions made in the creation of an interactive platform that are intensely personal and directed. One's obsessions, myths, nightmares, values, and biases are clearly reflected even in the most open pieces [...] the pleasure of the work is still in seeing how surprising behaviors might emerge during interaction. We engineer a platform, but people build their own relations, be it party or funeral. '(4) Indeed, his input was mostly parametric rather than direct, a gentle guiding of the viewer in the hope that the results would be mutually entertaining. You could not wish for a more affable media artist; Lozano-Hemmer said goodbye to the citizens of Yamaguchi with an outdoor barbecue party where he took the role of DJ. 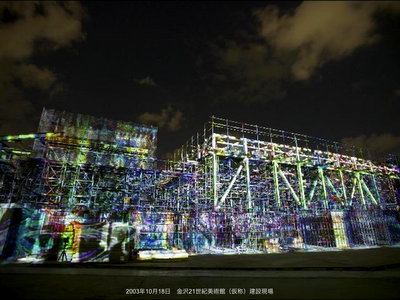 well it captures the temporal dimension, equating the shrinking of exposure time with a corresponding loss of 'aura'. The exposure times of early photographs were measurable in hours, and the resulting stills were unavoidably imbued with traces of turbulence, a virtual dynamism collapsed into static images; there is no such thing as a still life. Reproducing time-dependent art in the pages of a magazine is problematic to say the least. Ideally, these photographs capture a sense of the original continuity and movement, but they are still no substitute. This is work that must be experienced in its full singularity, locality and temporality: media art, unmediated. Consciousness Down To Size", Penguin Books 1999, pp138-139. 2. Akira Hasegawa, Digital Kakejiku project statement. 3. 'The Girl In The Magnesium Dress' was originally released on Ensemble Intercontemporain, 'Boulez Conducts Zappa: The Perfect Stranger' (EMI,1984), and later on Ensemble Modern, 'The Yellow Shark' (Rykodisc, 1993). 4. Brian Massumi, from a lecture at YCAM on November 2, 2003. 5. Rafael Lozano-Hemmer, from a conversation with the author at YCAM on October 26, 2003. 7. Walter Benjamin, 'Little History of Photography' in Selected Writings: 1927-1934, Harvard University Press 1999, pp 507-530.